Cogeneration has proved to be an economically and environmentally friendly technology that is ideal for highly specialised sectors such as the chemical and pharmaceutical sectors. Patheon Italia S.p.A. is a multinational leader in the sector of pharmaceutical toll manufacturing and in Italy, where it is growing at a staggering rate, it has chosen to adopt a “green” policy related to energy efficiency. It has chosen AB, world leader in the cogeneration sector, with a view to rationalising use of fossil energy sources, with an economic saving as a result, as well as improvement of the environmental situation as regards greenhouse gases, for its state-of-the-art production sites in Monza (MB) and Ferentino (FR). Industrial cogeneration, in particular the high-tech engineering offered by AB, proves to be an excellent solution for companies in various sectors which focus great attention not only on the quality and excellence of their own products, but also on economic savings, energy efficiency and environmental protection. Patheon Italia operates in a very specialised sector - the pharmaceutical production sector. This industrial company is closely linked to the local area, with a significantly international hallmark. Despite the contingent economic state of affairs, Patheon is going against the trend, with the awareness that investments are one of the most important instruments. Not only to withstand the crisis, but also to continue to grow in terms of turnover, with a positive impact on the development of the local area, both with regard to the surrounding industry and employment, and in terms of a policy attentive to energy efficiency and impact on the environment. The company works in facilities equipped with highly sophisticated, cutting-edge machinery and systems, which are continually renewed and enhanced with all possible technological innovations that can optimise production and improve the quality of the processes and end products, from a green perspective. That is why Patheon Italia chose to build a cogeneration plant from the ECOMAX®Natural Gas Line, inside its own production plants in Monza and Ferentino. 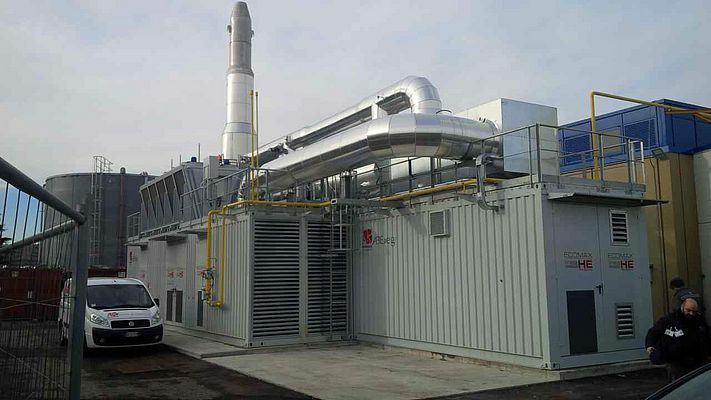 The plant, an ECOMAX® 20 HE, is powered by natural gas and is a modular solution in container, with overall rated power at full load of 2,004 kWe, and cogenerated thermal power of 1,835 kW, in relation to thermal power input of 4,477 kW. The new cogeneration plant produces electricity which, net of consumption by the auxiliary equipment of the power plant, is used to supplement the energy demand of the plant, while the cogenerated thermal energy will be exploited for technological and production uses by means of the production of superheated water (approximately 175°C) and hot water (approximately 90°C). This investment became necessary to meet the energy and economic requirements of the company (which works around the clock) and, just as importantly, to operate in line with environmental sustainability. The new plant is expected to cut CO2 emissions by 3,300 tonnes per year, and the unit should be operative for around 8,000 hours/year.